Creative friendship between the orchestra and Stephen Goncharenko struck up with the beginning of the "The life has opened" project. Stephen has been working hard to improve his vocal skills and made considerable progress for a spell of time. God granted him with passion for singing and unique timbre allowing to perfectly perform classic arias, the pearl of folk and popular music. 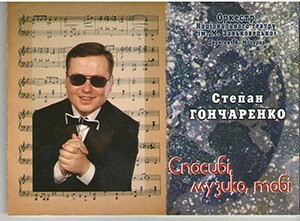 Twelve tracks are recorded on his CD "Music, thank you" - this is only a small part of the repertoire of S. Goncharenko.